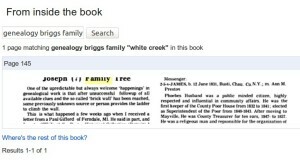 Who doesn’t use Google Books? If you do not then you are missing out on one of the largest collections of printed works that will lead to clues for historians and genealogists. Those of you that do use http://books.google.com/ often, know just how valuable of a research tool this enormous and growing collection is. There are hundreds of thousands of books that will help you find clues to your family history. By using all the normal types of keyword searches you are guaranteed to discover something that someone has published about your ancestors or relatives. By searching for a full name in quotes and a one or two keyword like a location or event, up will pop several selections to choose from. Be creative, if you don’t find it right away, reverse the procedure, such as put a specific location in quotes and then maybe just a surname. Many of these titles that are out of copyright are apt to be available in their entirety in pdf or electronic text format, and if so then you may download a full copy to your own computer to have and use at anytime, as you build a digital library of often rare books that would be priced way beyond the budget of the average armchair researcher. Now comes the rub. Those dog-gone Snippets. If the book is still in copyright you might only get a small window of text that may or may not have enough clues to tell you what you want to know. You no doubt wish that you could see the whole page or a few pages from a chapter that would give you a much clearer view of data that you want to use in your research effort. Well now there is a way to have that page or a few pages scanned, digitized and emailed directly to your inbox! This exciting work around of snippets is brought to you by none other than those fabulous, wonderful volunteers that work at the Family History Library in Salt Lake City. 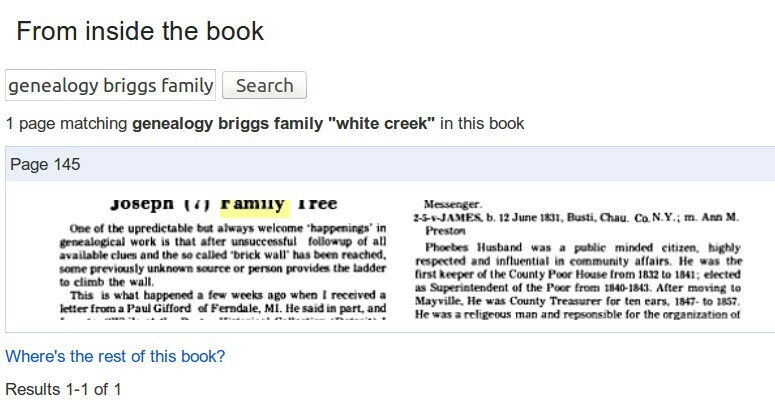 Now part of the FamilySearch “Free Lookup Service” involves a contact form and procedure that allows researchers anywhere that have an Internet connection to contact the Family History Library and ask for digital copies of the page or pages of the specific title and page numbers that you found in your Google Books Snippet view. A volunteer will locate the title in their collection and email you just the part that you need, for FREE! Go to the FHL online photoduplication request form and get started. This news was one of the best gifts that I found under my family tree this season. ps: If you have used this service or have additional thoughts about Google Books to share with our readers, please leave a reply in the comments section at the bottom of this blog post. Your Ancestors Gravestones in Front of Your Eyes Right Now! Good News: The NYS Vital Rcords Index is Coming Online! New York, State Health Department, Genealogical Research Death Index Starting to Come Online on Good News: The NYS Vital Rcords Index is Coming Online! nygenes1 on Your Ancestors Gravestones in Front of Your Eyes Right Now! Copyright © 2009-2010 UNYG Blog. All Rights Reserved. Powered by WordPress and WordPress Theme created with Artisteer by Steve Gorney - s-go Consulting.